New Horizons completed a quick, two-week maintenance wakeup on Jan. 17 and is back in hibernation. 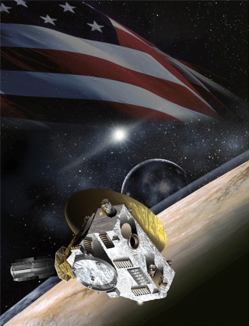 We’ll wake the craft again in mid-June for our last active checkout, lasting about 10 weeks, on the journey to Pluto. We’ll hibernate again from late August through early December, and then wake our baby up for the encounter we built her for. By this time next year, we will be executing the earliest phases of our Pluto system encounter. Closest approach is now just 17 months away! That may seem like a while to you, but after almost 97 months in flight, it’s just around the corner to us. Most people may not appreciate it, but 2014 is the last year, forever, that Pluto and its moons will be known only as points of light or smudgy images to humankind. Beginning this summer, we will take you along with us more intimately on our preparations to explore the Pluto system. The stories we’re going to tell as encounter approaches, culminates and recedes will cover more than the progress of our encounter flight plan and the data we’ll receive —though those elements will certainly be covered well too. But in addition, we’re also going to tell the story of how and why this mission was funded – by being ranked the No. 1 priority of the National Academy’s 2000s decadal survey in planetary science. Also, we’re going to be talk about U.S. leadership and preeminence in planetary exploration, of which New Horizons is one kind of demonstration. But there’s more. We’re going to talk about the danger of debris strikes that our lone spacecraft may face as it flashes through the Pluto system on the morning of Tuesday, July 14, 2015 – and the decisions our team will have to make about those risks. We’ll also talk about the extreme degree of persistence it took on the part of the scientific community and the mission team, weathering five cancellations, a plutonium fuel shortage, the death of key project engineers, and more, to get this mission funded, and built and launched on a schedule so tight that many people thought it could not be done. We’re going to talk about the dream of exploring Pluto becoming reality, and the large role teamwork played in that. We’re also going to recount the work of 20th century astronomical pioneers Percival Lowell, Clyde Tombaugh and Gerard Kuiper – whose pluck, persistence and personal skill led to the discovery of Pluto and the Kuiper Belt. So too, we’ll discuss what planetary scientists have discovered lately about the diversity of planets in our solar system — and that vast, new, third zone of the solar system called the Kuiper Belt. We’re going to talk about New Horizons launching faster and going farther than any space mission ever has to reach its prime target. And we’re going to talk about the high-tech miniaturization that makes New Horizons the successor to the Voyagers at only a fraction of their size, and mass and cost. And we’re going to talk about humankind’s insatiable urge to explore new frontiers. So stay tuned, we’re almost there. Before I close this PI Perspective, and before we begin this encounter with its earliest precursor events this summer, I want to say a heartfelt thanks. First, a big thanks to you – for following our little spacecraft across eight years and nearly three billion miles of almost unfathomable emptiness called space, as it’s undertaken a trailblazing, truly larger-than-life journey to a far away frontier, and into history. And my even bigger thanks go to the American people, for supporting NASA and its historic and unmatched program of planetary exploration. We on the New Horizons project like this particular artist’s concept of our flyby at the top of this PI log. We like to show it off too, because we know who paid for this mission. We’re going to do our best to make you proud, to deliver the goods at Pluto, and to tell you the many stories that form the narrative of New Horizons along the way. Hold on to your hats, the curtain on those stories is about to rise! Keep on exploring; we will too!